Cardiff City earned back-to-back away wins for the first time this season as Peter Whittingham's brace completed a league double over Huddersfield Town. After a dour start, Cardiff led through Whittingham's neat finish, before Nahki Wells fired Huddersfield level. Loanee Lex Immers, making his first Cardiff start, restored their lead before Whittingham's stunning free-kick made the points safe. Harry Bunn smashed in a consolation for the hosts in second-half stoppage time. Defeat brought the Terriers' five-match unbeaten home run in all competitions to an end. Whittingham's opener brought the game time to life as he swept home Anthony Pilkington's cut-back, before Wells' low effort made it 1-1 before half-time. Dutchman Immers, who arrived on loan from Feyernoord earlier this month, finished off a fine team move after the break as Cardiff improved. Whittingham sealed the win direct from a free-kick with a superb finish, before Wells fed Bunn to give the Bluebirds a late scare in the closing stages, but the Welsh side held on. Huddersfield, who were without suspended defensive duo Mark Hudson and Tommy Smith, struggled to create openings and remain 17th in the Championship. 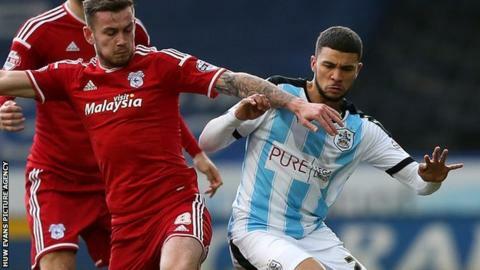 Victory lifted Cardiff to within one point of eighth-placed play-off hopefuls Ipswich Town, who do not play until Tuesday. Match ends, Huddersfield Town 2, Cardiff City 3. Second Half ends, Huddersfield Town 2, Cardiff City 3. Harry Bunn (Huddersfield Town) wins a free kick in the defensive half. Foul by Sammy Ameobi (Cardiff City). Goal! Huddersfield Town 2, Cardiff City 3. Harry Bunn (Huddersfield Town) right footed shot from the centre of the box to the top left corner. Assisted by Nahki Wells with a through ball. Attempt missed. Nahki Wells (Huddersfield Town) right footed shot from outside the box misses to the right following a set piece situation. Attempt blocked. Nahki Wells (Huddersfield Town) right footed shot from outside the box is blocked. Substitution, Cardiff City. Kagisho Dikgacoi replaces Stuart O'Keefe. Attempt saved. Jamie Paterson (Huddersfield Town) left footed shot from outside the box is saved in the centre of the goal. Assisted by Florent Bojaj. Substitution, Huddersfield Town. Florent Bojaj replaces Kyle Dempsey. Dean Whitehead (Huddersfield Town) wins a free kick in the attacking half. Corner, Cardiff City. Conceded by Dean Whitehead. Goal! Huddersfield Town 1, Cardiff City 3. Peter Whittingham (Cardiff City) from a free kick with a left footed shot to the top right corner. Foul by Jason Davidson (Huddersfield Town). Stuart O'Keefe (Cardiff City) wins a free kick in the attacking half. Substitution, Cardiff City. Aron Gunnarsson replaces Lex Immers. Corner, Cardiff City. Conceded by Jed Steer. Attempt saved. Joe Ralls (Cardiff City) left footed shot from outside the box is saved in the top left corner. Nahki Wells (Huddersfield Town) is shown the yellow card. Attempt saved. Nahki Wells (Huddersfield Town) right footed shot from the centre of the box is saved in the top left corner. Assisted by Martin Cranie with a headed pass. Fabio (Cardiff City) is shown the yellow card for hand ball. Hand ball by Fabio (Cardiff City). Federico Macheda (Cardiff City) wins a free kick in the attacking half. Substitution, Cardiff City. Federico Macheda replaces Anthony Pilkington. Karim Matmour (Huddersfield Town) wins a free kick in the attacking half. Attempt missed. Martin Cranie (Huddersfield Town) header from the centre of the box misses to the left. Assisted by Jamie Paterson with a cross following a corner.